Working in museums can be a messy, messy game, but I always love the conversations that crop up when you get a handful of museum educators together to talk ‘shop.’ A couple weeks ago at the National Art Education Association 2013 annual conference in Fort Worth, there was certainly a lot of that happening. I was fortunate enough to be invited to present — or rather have a public in-process conversation — about participatory culture in art museums with an incredible group of colleagues: Preston Bautista (Deputy Director for Public Programs & Audience Engagement, Indianapolis Museum of Art), Judy Koke (Director of Education & Interpretive Programs, Nelson-Atkins Museum of Art), and Susan Diachisin (Director of the Center for Creative Connections, Dallas Museum of Art). By far, the best part of preparing our presentation was the series of winding, organic conversations that led to Fort Worth. Not only were we all wildly passionate about visitor engagement and participatory practice, but our own working environments were all changing rapidly — from my own move from St. Louis to the Portland Art Museum this past fall, to leadership changes and various grants & innovation projects. All in all, we were fairly hyper-motivated to talk about these issues with each other and, ultimately, to explore concepts of participation and exchange in our institutional cultures. How does an institution’s hierarchy, leadership, and organizational structure actually enable (or disable) participatory practice? How could museum educators at various levels become more involved in fostering an institutional culture focused on visitor experience and engagement? Could these values find ways of ‘trickling up’ from participatory programs and smaller-scale education projects or exhibitions? There is a shift happening. Art museums across the continent are taking big steps to change the ‘business as usual’ model, creating structures to put the public’s expectations, needs, and experiences at the center of interpretive planning and exhibition development. We can see this in institutions such as the Detroit Institute of Arts (see great article by their Exec Dir of Learning & Interpretation), Art Gallery of Ontario, Denver Art Museum, Indianapolis Museum of Art, Nelson-Atkins Museum of Art, and the Philadelphia Museum of Art, among many others. In the specific realm of ‘participation’ and public engagement, it is always important to note the Irvine Foundation’s support for institutions such as the Oakland Museum, as well as museum “Innovation Stories” featured via EmcArts & ArtsFwd. If you still need convincing that change is afoot, watch this video compiled by the Innovatrium at their January 2013 ‘think tank’ of museum leaders. We’re all in this together. Instead of anyone pretending to be an ‘expert’ about these changes in organizational culture, we wanted to be conscious of the fact that we are all co-learning with each other. It doesn’t matter the size of one’s museum or how involved your senior leadership is in this shifting landscape — we’re all working toward the greater public value and relevance of museums in our communities and beyond. And this needs to be an open, inclusive conversation if it is to be meaningful one. 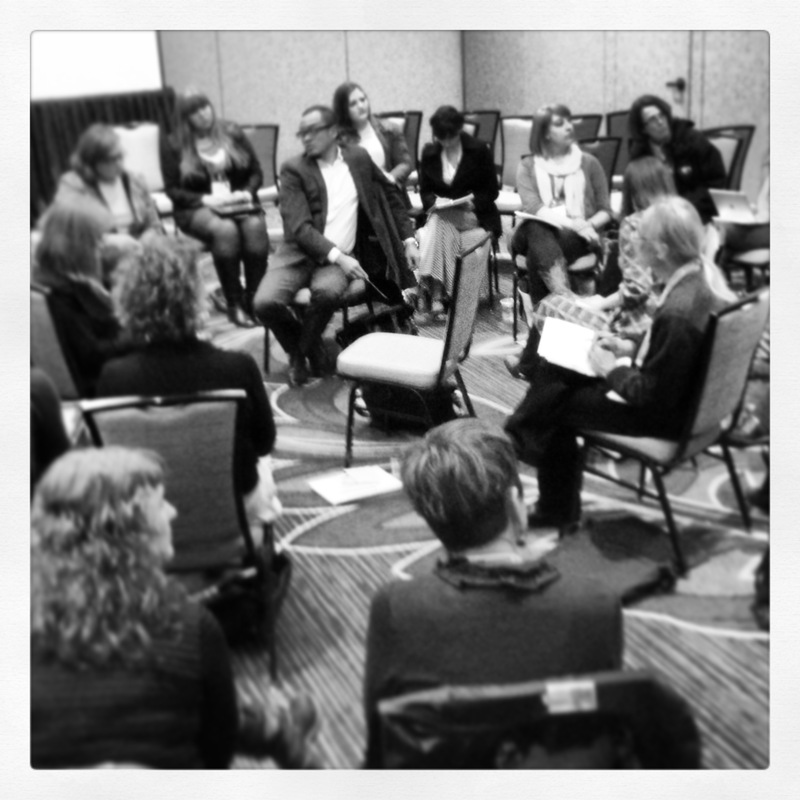 You can’t talk about participatory practice without becoming participatory. I always feel like every lecture on “visitor engagement” and “participatory practice” is, in part, quite disingenuous if it does not attempt to actually ENGAGE. Even if an attempt to activate a lecture hall full of 200 spectators fails, I always feel that we should try — walk the walk, right?! So I was able to convince our group to do a crowdsourcing activity to engage those attending our session, and pull out their ideas in a participatory way. What if everyone in the museum understood everyone else’s job? What if there was a real plan for interpretive team development of exhibitions and permanent collections? 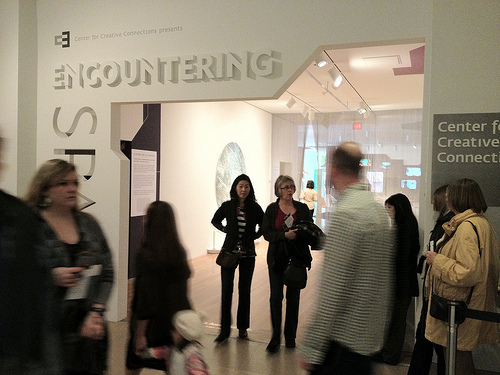 What if curators and educators didn’t feel like they were ceding territory when they worked together? 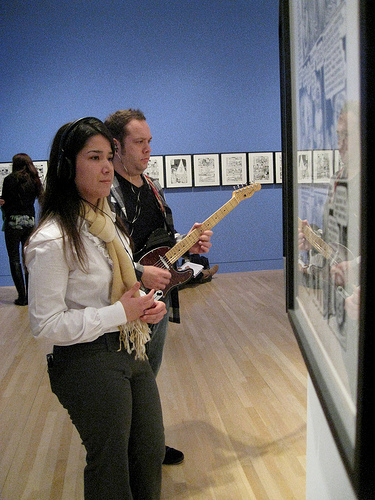 What if educators/interpreters and curators worked collaboratively on creating in-gallery participatory experiences? What if I could include funds for “things I may think of after the budget process” [an “innovation” fund] when I’m writing my department budget? 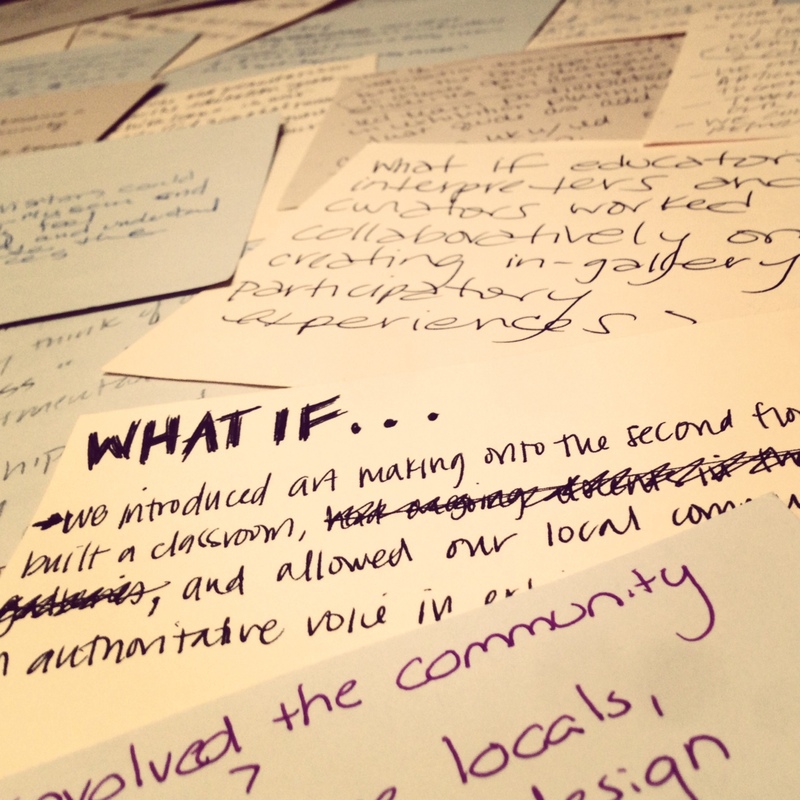 Rather than recount the conversation or provide my own opinions, thoughts, and perspectives here, I wanted to take this opportunity to open the conversation … to OpenThink the “what if” statements we collected during our NAEA session. So below is a link to all of the “what if” statements that we were able to collect, in no particular order. Feel free to peruse, and add Comments to the GoogleDoc if you choose. I invite you to share these with colleagues, send this to others at your museums (yes, curators, too! ), and let’s create a conversation in the GoogleDoc or below in the Comment area. Do you have a “What If” statement that you would like to add? Are these concerns about exhibition planning, community involvement, and staff development similar at your institution, or different? How can we engender more participatory practice/culture in our work? in our institutions? I fully acknowledge and embrace the exciting shift that has been occurring in art museums, arts organizations, and American culture in general toward a more do-it-yourself, interactive, user-generated, participatory experience. Yet outside of experimental cases and one-time projects, I often struggle to weave this approach into my daily professional practice and hence into the daily experience for museum visitors (which in my case is mostly school children, visiting with their teachers who have set expectations about what they will see and learn). And I blame forward-thinking educators like Nina Simon (among others) as well as a whole range of contemporary artists for motivating me to want this level of visitor engagement and participation in the first place (thank you Nina et al.). So how do we “walk the walk” when it comes to truly engaging visitors and students in creative, participatory, learner-centered experiences in the art museum? For me, it’s always about taking risks and experimenting bit-by-bit, program-by-program, teacher-by-teacher, and even docent-by-docent as we sharpen our focus on creating a “better” experience with art that connects to people and their lives. And for this post, I want to hone in on one recent docent training class at the Saint Louis Art Museum — a micro-study of an attempt to weave a hint of participatory practice into the fabric of the art museum, and make it more about “doing” and not just about “viewing.” Is this truly participatory engagement? To what extent is this something museums have always done? Not sure. I’d actually rather invite your thoughts and comments, since I think it’s best to open up a dialogue and push these ideas forward. Please offer your challenges and responses below, and give me something to think about as I create new experiences. As a field, I think we’re definitely in the process of defining what we mean by terms like “active participation” and “participatory engagement.” In what contexts can these types of experiences occur, at what level of engagement, for what audiences, and when? I know my example below does not compare to something on the scale of a contemporary art installation that has children placing thousands of stickers on the gallery walls or the careful planning of in-gallery interpretation like this project on view now at the Skirball Cultural Center, but it connects more to my own daily professional practice with school audiences and docents. 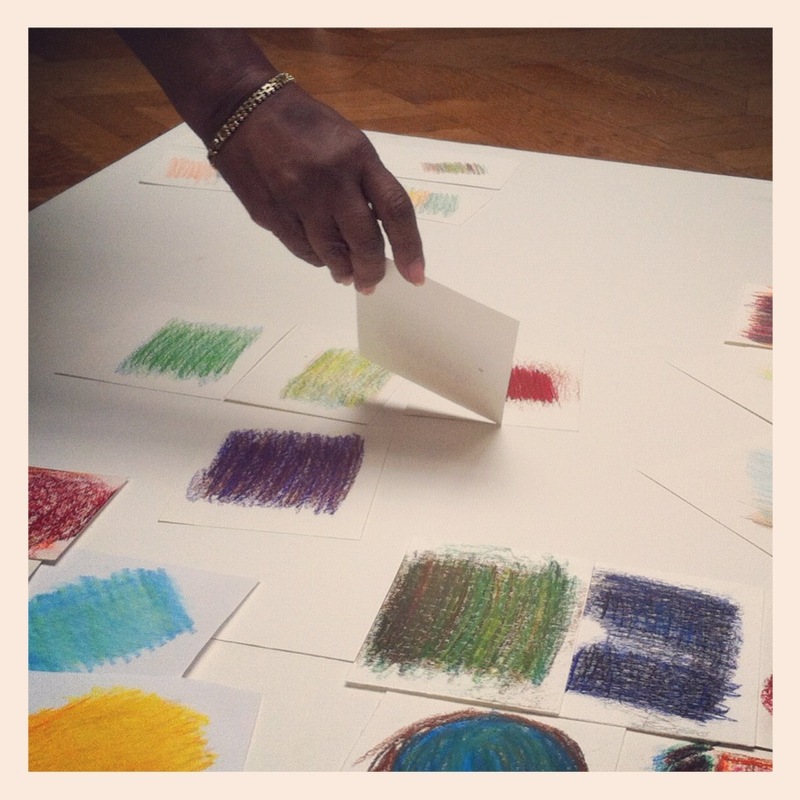 Exploring Van Gogh & Color … in a Participatory Way? Working within a docent curriculum at a large public art museum, there is still a strong focus on art historical information, as you would imagine. Within docent training programs at art museums across the country, about 40-50% of the content is purely art historical and about 30-40% of docents’ time is spent listening to lectures about that content (that is based on some data that Stephanie Parrish [Portland Art Museum] and I collected last year from about 100 art museums). So when beginning to prepare my docent class on the Impressionism and Post-Impressionism collection area, there is always an initial tendency to pull together that PowerPoint slideshow or pick up the phone to call the curator. But not this time. I wanted to explore at least one strategy that would get us beyond a purely receptive experience with these artworks, and work toward something that the recent Irvine Foundation report might call “inventive engagement” on the spectrum of creative participatory experiences. I feel strongly about museum experiences tapping into the “creative” side of learning, and one of the CORE elements of museum learning for my department at the Saint Louis Art Museum is “engaging in creative ways.” For docents, this creative element of learning is generally not studio-based but rather gallery-based. Looking and Learning: We started out like many of my experiences with docents begins, with a process of looking and conversation (a la Rika Burnham and Elliott Kai-Kee’s process of “guided interpretation”). For about 20 minutes, we examined Van Gogh’s painting as a group, interconnecting comments, observations, and thoughts with information about Van Gogh and the social, industrial, urban, and suburban context of Paris brought into the conversation when it would support or respond to someone’s ideas. 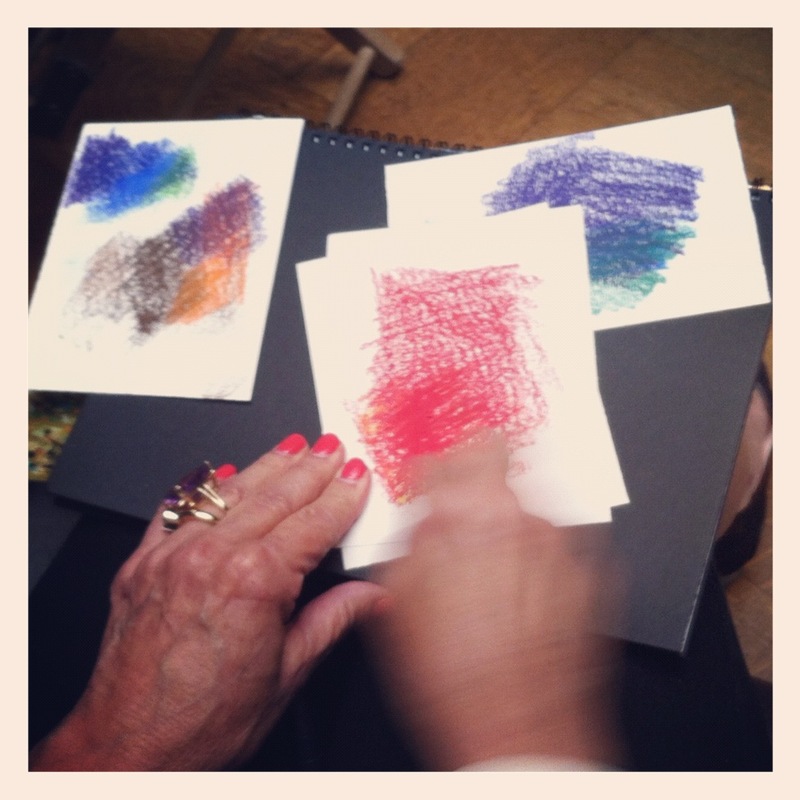 Playing with Color: Next, I asked docents to pair-up, and each pair was provided with a hi-resolution detail photograph of the Van Gogh painting in addition to eight small squares of drawing paper and a set of woodless colored pencils or Art Stix. Their task was to explore their detail, identify four colors, and then try their hand at creating a color study for each. My overarching goal here was to allow everyone to play with color — what is it like to layer colors, place them next to each other, use pure color, use thick lines, rub the side of the pencil, etc. There were very few rules placed upon this exercise, which was intended to support free exploration of color and a fresh examination of Van Gogh’s use of color (which is nearly jewel-like in this particularly-stunning painting … yes, I happen to love this work). Is this truly participatory practice? The central question I am exploring here is whether this “color map” exercise actually gets us past a receptive, interpretative engagement with art and more towards a creative participatory engagement. 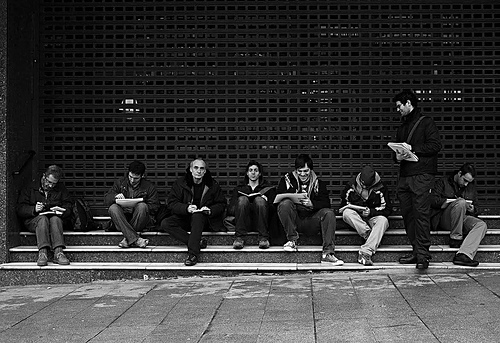 The authors of the Irvine Foundation report define the starting point for participatory practice as beginning when audience members become an “expressive participant in the making of the artistic experience.” So not just activating the creative mind, but also involving creative expression on the part of the participants. Check. I also think that a key element of participatory practice to to cede control to the group in a productive way. While there are activities that can allow participants to create something, I feel that they need the freedom to organize and remake as they go along (this can be a bit scary for us educators). When the docents were laying down their color studies on the larger white surface, they began to take creative control over the project (some more than others), which was something I distinctly noticed. As we all know, being creative is not simply following directions or coloring within the lines, but pushing in new directions and unpredictable pathways. 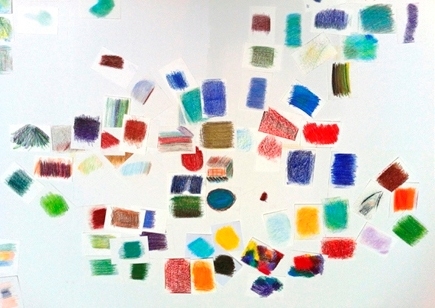 If we had more time in the galleries, I have no doubt we could have remixed and rethought our color map. After leaving the museum, in fact, several docents did send me their ideas for adapting and expanding the activity in exciting ways for school tours and programs in the future. To me, engaging in more and more of these participatory experiences is essential to the work that we do. Some museums are really blazing the trail for us, which is exciting. In addition to public programming and exhibition design, it’s also important to consider these practices with our work in docent education and professional training as well as our interactions with K-12 school groups (which make up such a large segment of the museum audience, and the most democratic, diverse, and inclusive picture of museum use that we have, as Eilean Hooper-Greenhill states). Bit-by-bit, docent-by-docent, and teacher-by-teacher, we can continue to work toward museum experiences that engage the collaborative, co-creative, open source mindset that is present in our communities as well as the next generation of visitors. 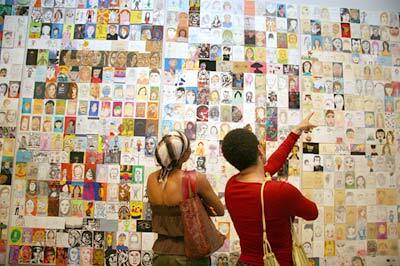 What participatory experiences have you developed at your museum? 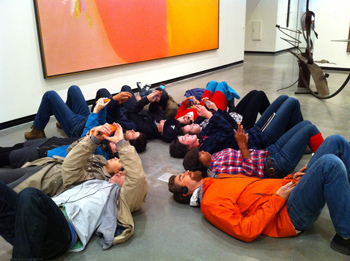 What are some challenges you face in creating these experiences for K-12 audiences as well as general museum visitors? The report’s human-centered focus brings much-needed attention to the ability of the arts (and arts institutions) to connect people, to create shared experiences, and to contribute to the cultural fabric of the communities in which we live and work. For art museums (and museum educators, especially), the report provides an extremely meaningful tool for reflecting on how we involve audiences in shaping their own experiences and making their own meaning. The report’s “Audience Involvement Spectrum” provides a nice, workable model for audience engagement, from “receptive” involvement (the type of spectating and educational enrichment occurring in the vast majority of arts museums) to increasingly “participatory” involvement (the types of crowd-sourcing, co-creation, and public artistic experiences that more and more art museums are slowly striving toward). The report is worth a close read. 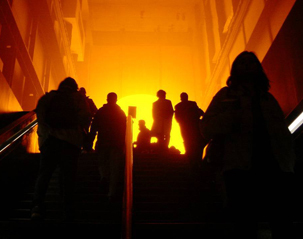 It asks some essential questions about arts programming in the 21st century, and I think art museums would have much to gain by thinking more about how they fit into this new landscape of active arts participation. As museum educators, we have our hands on the wheel when it comes to programs — and the Irvine report clearly and strongly states that “attracting the next generation of audiences and visitors will require a transformation in programming” (11). At the core of this transformation is both thinking outside the box (‘the box’ in this case being the rigid walls and traditions of art museums) and letting go of institutional and curatorial authority so that visitors can feel comfortable and empowered to shape their own creative experiences. If you have a chance to peruse the Irvine Foundation’s report, I’d love to hear how your institution’s programs (or your own teaching philosophies) fit on their spectrum of audience involvement. 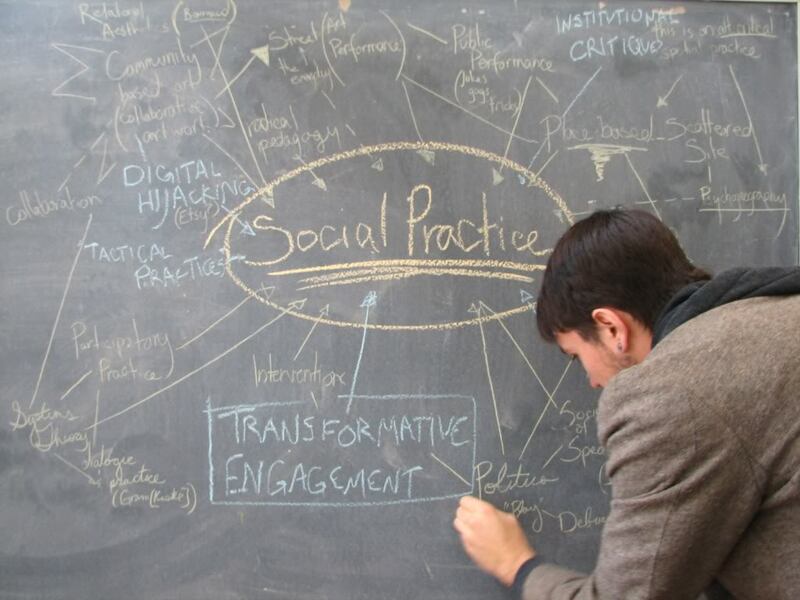 Has your institution embraced any of these aspects of participatory arts practice? Do you value these types of creative, artistic experiences when you visit art museums yourself (or do you shy away from them for more passive types of engagement)?